I did it. I finally worked up the courage to brush dark paint on some of the walls in my home. And let me just say that I love how paint adds warmth to my family room! 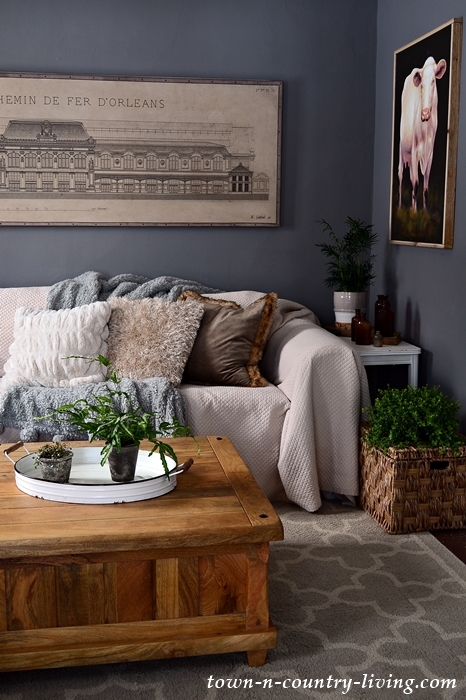 Today is the first Saturday of the month so it means I’m joining a few blogging friends for our Cozy Living series. You can visit their links at the bottom of this post to see how they enjoy cozy appeal in the month of February. I’m enjoying it with a new coat of paint. My main goal in using a dramatic wall color was to make the Paris train station canvas art stand out. I felt like it was getting lost on the wall and it’s such a statement piece. My family room now wears Mole’s Breath on all four walls. Although the color is from Farrow and Ball, the paint itself is Benjamin Moore. 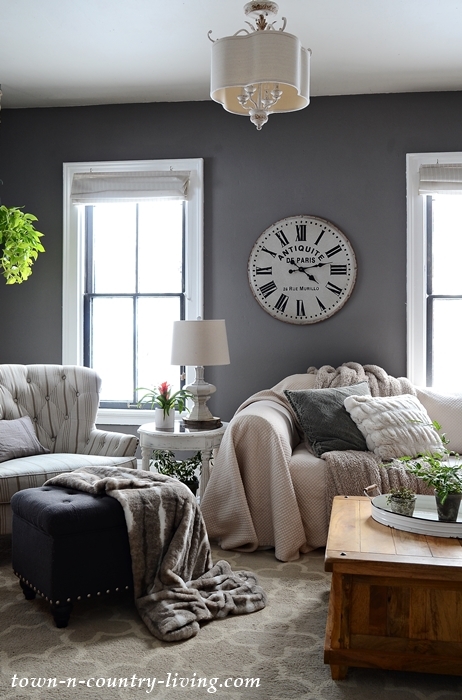 In addition to adding warmth to the family room with a dark gray paint, I added definition by giving the windows a two-tone treatment. White paint on the window frames and dark, almost black, gray paint on the window inserts. The color is Wrought Iron by Benjamin Moore. I decided to leave the curtains off the windows and just go with soft Roman shades. A couple weeks ago I had three sample paint colors on the wall in the family room. Mole’s Breath was the darkest color. I almost didn’t choose it because it’s out of my comfort zone. Truth be told, I’m a little proud of myself for trying something new and going bold. I love the cozy warmth of our family room with its new paint color. I think the Paris train station now pops off the wall the way I hoped it would. 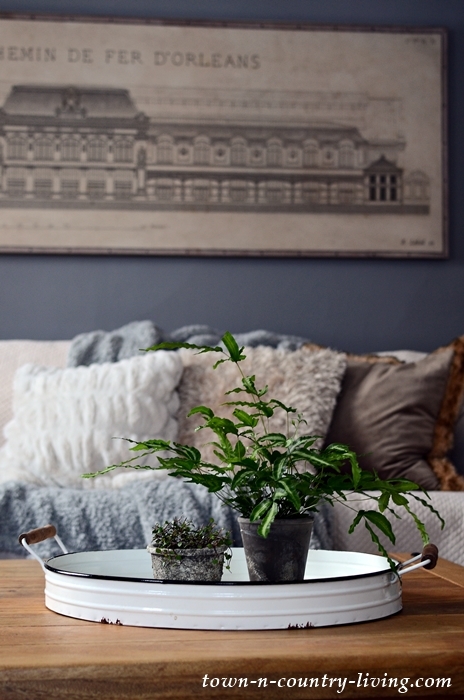 The room has a few new plants, too – like this little fern from Grow Geneva. It’s a new plant store in town that my daughter and I frequent all the time. 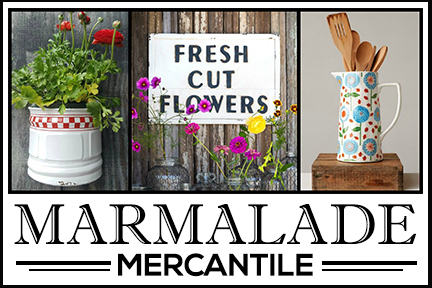 If you live in the area, be sure to check it out. 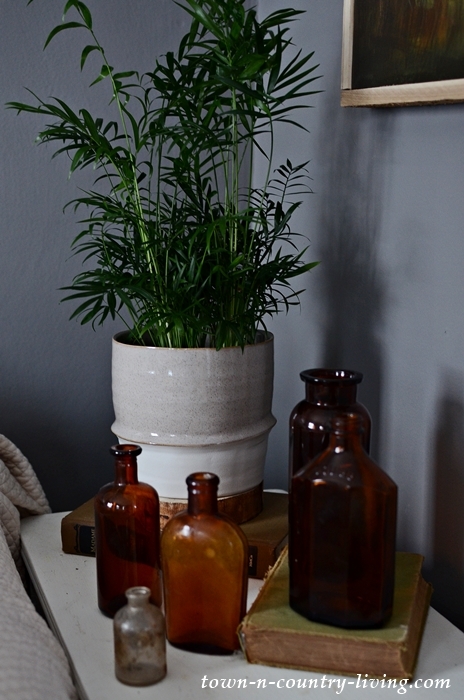 The Parlor Palm is also from the shop and it looks cute with some of my vintage brown bottles. Plus I love the way the green leaves look against the dark gray paint. 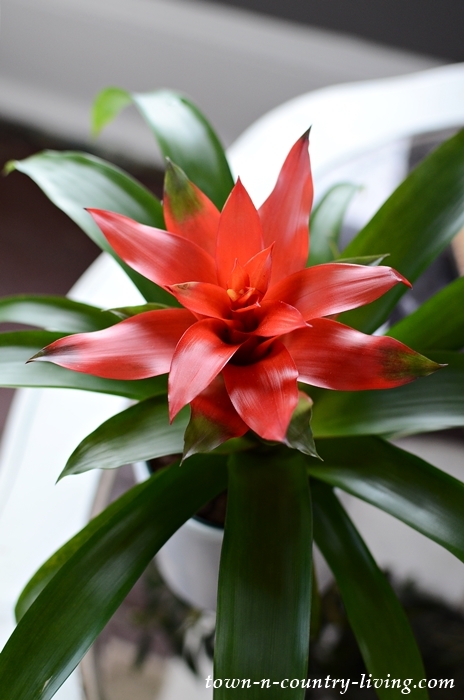 Another new member of our little plant family is a Bromeliad. It adds a tropical vibe. I now collect plants instead of bottles and white ironstone! Next on my list for the family room is a new sectional. 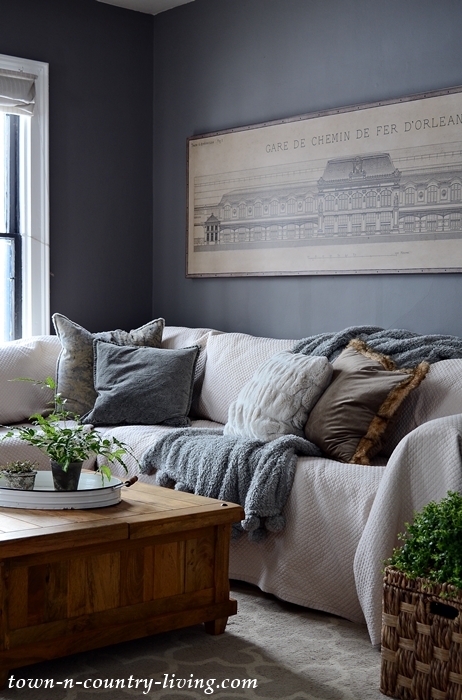 I’m tired of keeping my white sectional covered all the time in order to keep it clean. I don’t know how long it will take to find the right one, but it’ll be worth it. I enjoy the journey of giving a room a makeover! Be sure to visit my friends below to see how they’re enjoying cozy living during the month of February! Your family room u s lovely! Between the dark walls, white trim and the metal looking window frames, It’s perfect. Good for you! I am loving the color of your room. It is amazing how it can change the feeling of a room, and if its not what you want, you can always try again. I have a lot of wood work in my home, so earthy tones work very well with it. Do you plan to paint any other rooms? Your decorating is beautiful and fresh. Have a wonderful day. I love the warmth your new paint color has added to you family room. I did have to chuckle at the color name. I guess with thousands of paint colors, it’s not easy to come up with catchy names…haha. I plan to paint my window grids black or charcoal and then continue painting interior doors the same. My question for you is…did you paint all of your grids in other rooms in this dark color or only in this room? Have you painted interior doors dark? Thank you for sharing you beautiful new look! Jennifer I love it. I remember about 15 years ago everything in our old house was some version of white. One day I said to my husband I wanted our formal living room dramatic. 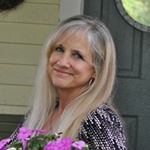 I chose a dark color called Caper Berry when Martha Stewart was working with SW. I was so happy I took the leap. I use color on our walls all the time but one room in our is always darker. I think it adds dimension and character. I did the white paint deal 25 years ago since John and I are married 30 years as much I appreciate people’s taste been there done that. Anyway the new color looks wonderful with greens. I bet dried Lavender will be beautiful too. It’s amazing what a difference color makes! Good choice! Looks great! That’s bold for me too. I probably couldn’t have done it ☺️ but you did good. Don’t you wish you’d done it long ago? As I do away with so much white paint, I always ask myself what I was waiting for. 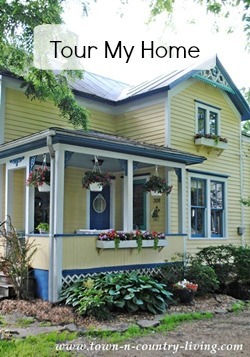 Your home is looking so amazing. Perfect paint color! What color sectional are you looking for? I think a leather piece would look nice, but I know what you mean about white it’s just too hard to keep up with. I’m glad I got rid of mine and went with something darker. I know white is in, but it doesn’t work with the men folk in my home. It really does look beautiful with white and green and other colors.I never would have thought how good it makes your print stand out, only you would have known but, that is why i follow you. Love the bold color in your family room. . . It looks great! Congrats on taking the plunge! 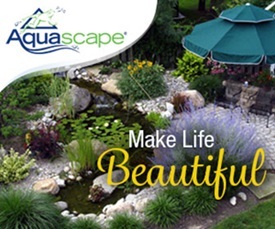 It adds to the beauty of your home. The colour is absolutely perfect Jennifer! I love how warm and cozy it makes the space feel, like it’s wrapping you in a cozy hug! I LOVE it! Jennifer you’ve outdone yourself! I loved the room before but I love it even more now! The rich color is gorgeous and you’re so right. It does had so much warmth to the space. Love it, friend! I LOVE this color in your home. It’s so cozy and warm. Your furniture looks lovely with it and I love that statement art. 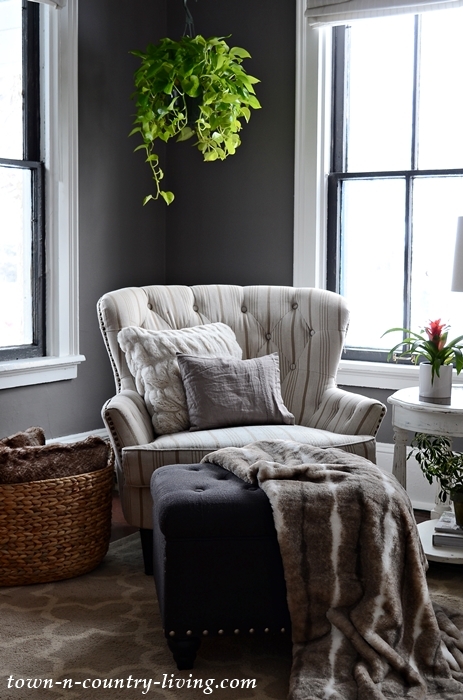 So pretty and cozy for winter, Jennifer! Oh my gosh, Jen! 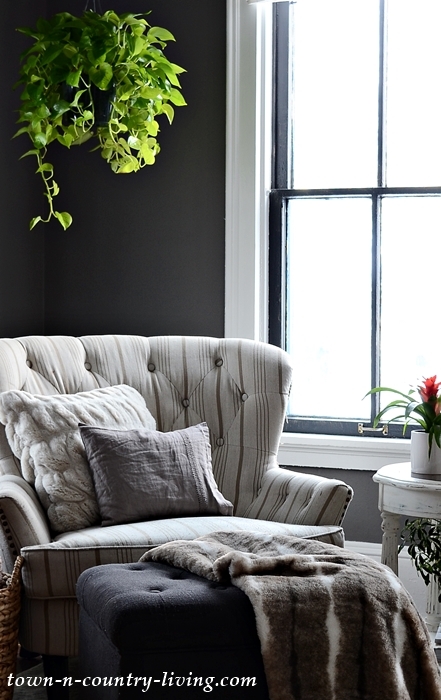 I am just loving these darker hues that are becoming so popular! They really cozy up a room! And, you were right! It does make that artwork just pop now! I also love how you painted your windows! And, I didn’t know you could have a Farrow and Ball color matched with Ben Moore paint? I guess you just take the F&B chip to the paint store for them to color match. I love the F&B colors, so I’m going to do this on some project that has yet to be dreamed up! YOU done good girl … great color choice and you’re room looks AMAZING !!! What kind of shades do you have? I have black windows also and like how yours are high unless you lower them. The color looks great! !